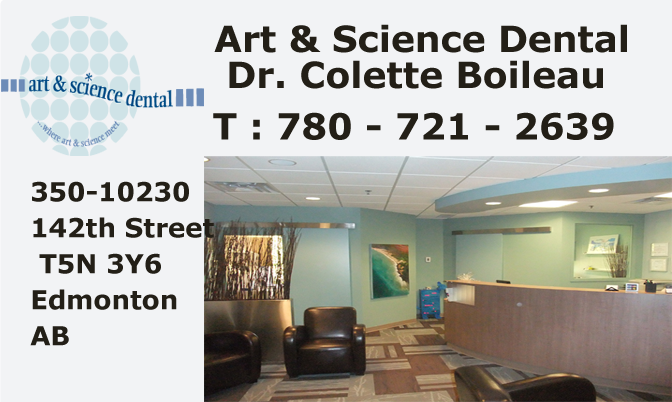 Dr. Colette Boileau and her team at Art & Science Dental want to give you and your family the best dentistry has to offer in a comfortable service oriented environment. We pride ourselves in the quality of the services, technology, materials and information we provide to you. We value the relationships we are able to develop with our patients; making you a partner in your oral health. At Art & Science Dental we believe prevention is the most effective solution in many cases. Fluoride treatments and sealants prevent cavities; and muscles training appliances to help prevent orthodontic issues in kids are a couple examples of preventive dentistry at its best.